Lapham Elementary School Staff noticed a natural gas smell in the building around 12:30 p.m. Wednesday (April 2) and a precautionary evacuation was ordered. 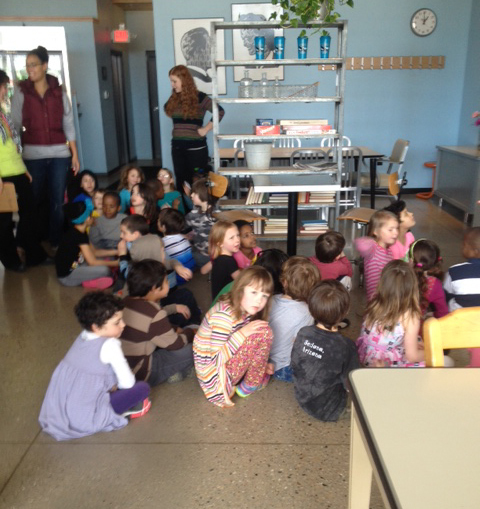 With approximately 250 children in the school, the nearby Salvation Army building did not have enough space to accommodate the entire school population. Enter Cargo Coffee East, which just opened in February. Co-owner Lynn Lee (with brother Lindsey) said he received a call from the school asking if they could take some of the overflow. Lee’s daughter Addison is a student at the school and he readily invited the students over. 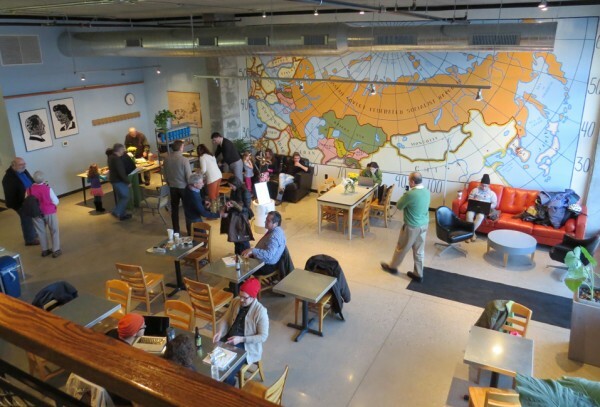 The coffee shop is a veritable educational refuge since the entire east wall of the shop features a large mural depicting a map of the world that was created by Lee who is also an artist. 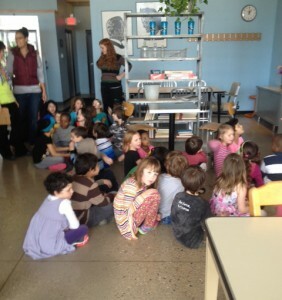 Approximately 150 students and 25 staff (kindergarten, first grade and four year-olds) were sent to the shop and Lee said he had to “hurry over” to move existing customers to the balcony to accommodate the arrivals. The evacuation lasted half an hour, but Lapham Principal Tammy Thompson Kapp said to Lee in an email that the district is considering adding Cargo East to its evacuation plans. Lee says Cargo will have a written policy for employees to follow should the site be needed again. While there is plenty of evidence that the event did happen, based on the response from one city department to our query, a little bit of mystery about the incident remains. In a letter to parents, Kapp said that the Madison Fire Department, Madison Gas & Electric and school district officials responded to the event. However, Madison Fire Department Spokesperson Laurie Wirth says they have “no record of a run to this address”. In a follow-up email Wirth said that she double checked department records and spoke with the station that would have responded to a call if it had been made. Wirth says she also spoke with a Lapham custodian who confirmed that there was a gas odor detected, and that MG&E was called. Wirth added that since no alarm was initiated, MFD did not respond. Kapp says that after an inspection was concluded the students and staff were allowed to return just after 1 p.m. and the school resumed normal operations . For their part, both Lee brothers were very happy to extend their help to the neighborhood school with Lynn remarking, “The teachers and the kids were just great…Every day I’m reminded how lucky we are here in Madison”. Update [5:09 p.m. April 2, 2014] Corrects number of students and staff that were sent to Cargo Coffee. Update [12:37 a.m. April 10, 2014] Adds additional comments from Laurie Wirth regarding discrepancy between events as recounted by Tammy Kapp and official MFD records. This entry was posted in Madison, Willy Street and tagged Cargo Coffee, Lapham Elementary School, Lynn Lee, Madison Fire Department, Madison Gas & Electric, Tammy Thompson Kapp by TheEastSider. Bookmark the permalink.